I was going to say The Black Cauldron is the most infamous film in the Disney Canon, but a most accurate statement would be to say it is the most non-famous film in the Canon. How many people that aren’t film or animation buffs know what The Black Cauldron is? When I first heard of of the movie, at age 9 or 10, I thought people were shitting me. Could there really be a Disney movie I wasn’t aware of? It seemed impossible, considering how I had been to Disney World and hadn’t seen a single clue of the existence of The Black Cauldron. It suddenly became apparent that one of the things in the Disney Canon was not like the others. For some reason, The Black Cauldron was an outlier. From a small age I could tell there were some old and some newer movies that were beloved Disney classics; and that there were other, not as well loved films in between. But I couldn’t yet grasp the historical circumstances that led to The Black Cauldron being forgotten and the key place it holds in the history of animated feature films. The story of what happened with The Black Cauldron is one of my favorite behind-the-scenes Disney stories. And one that officially signals the first steps towards the “Disney Renaissance” and the animated movies that made me fall in love with Disney. The quick way to explain what happened with The Black Cauldron is the following: Disney invested a lot of time and money in a project that didn’t work out. The film made 21 Million dollars at the box-office, and despite the official budget of the movie never being released, all signs point at the fact that making it cost much more than that. Some sources say it was one of the most expensive animated films produced up to that point (maybe even the most expensive) and the failure was a huge blow for Disney Animation, which was counting on it to bring back the glory days of yore. Its commercial failure, however, shouldn’t have been a huge surprise. At that point in time Disney was a company mainly known for the Theme Parks in California and Orlando. Nobody gave much attention to their animated films. They were an afterthought. What the people behind The Black Cauldron set out to do was, pretty much, to change that perception. They wanted to make a movie that would live up to the spirit of the older Disney Classics and something new and different that would capture the zeitgeist. Now, capturing the zeitgeist when making an animated movie, especially at the problematic pace Disney movies were developed at the time was not going to be an easy thing. The Black Cauldron, however, does kind of fits with the kind of fantasy and adventure movies that were popular in the mid-eighties. The source material for The Black Cauldron are the first two novels in the Chronicles of Prydain series by Lloyd Alexander. They mainly tell the story of young pigkeeper Taran, as he becomes a forceful warrior and fights the evil Horned King. The story is heavenly influenced by Irish mythology, but also, and most importantly, by the classic hero’s journey storyline that features enough similarities as to lure the teenage audience that made Star Wars into the biggest hit of the time (it even has a magical glowing sword!). The film also plays into the popularity of medieval fantasy and Dungeons and Dragons throughout the 1980s, but considering the film’s long production, it must have been a coincidence. Needless to say, The Black Cauldron didn’t attract much of a teenage audience. It also alienated family audiences that were expecting traditional Disney product and were met with an epic story featuring violent dark magic and an army of zombies. It was the first Disney film to receive a PG rating. I guess Disney gambled on pursuing a bigger audience and not only didn’t get it, but alienated the one it already had in the process. What’s fascinating to me about the failure of The Black Cauldron is that from any financial and logical point of view, it should have meant the end of the Disney Animation Studios, but for some reason the men in charge of the company at that time: Michael Eisner and Jeffrey Katzenberg, some of the most money-oriented executives in Hollywood decided to not only keep the animation department going, but make it successful again. Maybe it was the fact that by the time Katzenberg arrived at Disney, he was already wiling to bring the animation department back to the top. Maybe it was the fact that the studio itself seemed to be willing to do the same. The Black Cauldron was so expensive to make because the animators were determined to make the first great Disney movie since Walt’s death. For starters, they developed a new animation system, the ATP process, to replace the cheap-looking xerography that dominated the movies Disney made in the past decades and was also the first animated feature since Sleeping Beauty to be shot using the Cinerama process. Sleeping Beauty is actually a good example of the kind of epic the studio was trying to recreate in the visual style of The Black Cauldron. Whether it did so is a point of debate, I, for one, think it failed. But more on that later. The main problem with Black Cauldron all the way from the time of production was the story. The production was messy. many talented animators fleed the project when they had the chance. Like eventual Little Mermaid directors Ron Clements and John Musker, who went on to work on The Great Mouse Detective or a young man named Tim Burton, who left the studio in frustration. When Katzenberg arrived at Disney and saw the film, he decided to recut it eliminating entire scenes and some of the darker sequences. This is something that is usually not done in animation, especially after you’ve got the final cut of a film, since it would mean that the sound and score would jump or not sync-up properly. 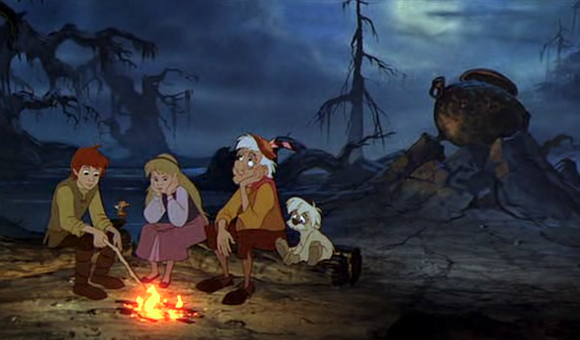 And so, when The Black Cauldron was released in theaters in the summer of 1985 (it was going to be released at Christmas 1984), the sound suddenly jumped whenever a scene had been cut. So, was the story of The Black Cauldron such a disaster? There’s no way of knowing what exactly Katzenberg saw before he cut the film (as far as I can tell, the complete cut has never been released), but what we get, although not exactly messy is far from compelling. As ambitious as the project might have been in the mind of the animators that worked on it, I can’t help but feel like the film is lacking anything truly inspiring .The closest thing to something truly memorable in the film is its villain: The Horned King (amusingly voiced by John Hurt). The design of the guy is appropriately terrifying and even though we do see him once earlier in the film, the scene in which Taran sees him for the first time is one really cool Darth Vader-like introduction (embed at around the 1:22 mark in the video below). The Horned King, sadly, departs the film in a very muted and anticlimactic way. And none of the other characters have a similarly slick or particularly original design to them. 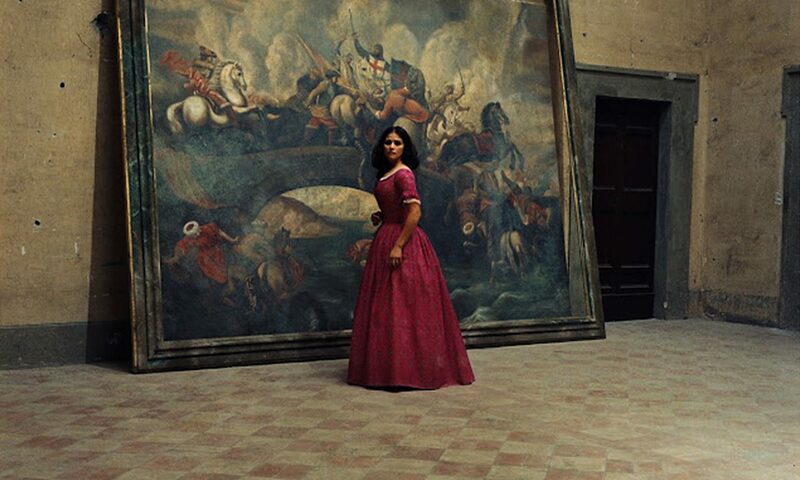 Neither is the look of the film or the art direction memorable in any way, certainly nowhere near the beautiful medieval tapestries of Sleeping Beauty. Like I said above, even if the film cost millions and it doesn’t look exactly cheap, it does look very uninspired in almost every aspect of its design. Most characters are also animated in a weirdly chopping way (the best animated character is Hen Wen, a pig designed in the very traditionally Disney way). It would also take a couple more years until the cinematic style of something like Pinocchio would be regained in a Disney feature, with most of The Black Cauldron being staged in a way frustratingly similar to that of a saturday morning cartoon of the time. The best example of this, and perhaps the worst scene in the movie, comes when our heroes bump into a trio of witches that must be the absolute nadir of character design in Disney history (I tried to find the clip on Youtube, but couldn’t find one of good quality). Going back to the story itself is also not much better. It’s true that the film follows the relatively effective hero’s journey structure, but that is not enough when the script around it is as bland and boring as this one. For something as different and dark, it is surely very boring to watch. Maybe it’s the fact that with the resurgence of fantasy adventure in the past decade I’ve grown overly familiar and merciless of the genre, but I can’t escape the fact that the most effective word to describe the story and characters in this movie is bland. Taran, our hero, is kind of a jerk and is really hard to root for him as our Luke Skywalker. The one character that shows true life, albeit briefly, is princess Eilonwy, who in her standing up to Taran and her role as a “girl” is a prototype for the great Disney heroines yet to come. This must be the longest post in the Disney Canon series yet. If you’ve gotten this far and haven’t seen The Black Cauldron, then I would say it’s worth the watch just to see what exactly this movie is. There are not many people I know that would call this movie a creative success, but there are many that appreciate the effort. I really don’t care for the film. I can’t stand its generic look and the script doesn’t really help much. I had only seen the movie once when I was a kid and first heard of it. I wasn’t a fan of it then, finding it very boring. I was curious to see what I thought of it with this re-watch. I was ready to appreciate the daring movie that didn’t quite work. I don’t know if maybe I was overwhelmed by the history of the movie, but The Black Cauldron remains a big disappointment for me. And one of my least-favorite movies in the Disney Canon. Next Time: One of the few Disney Canon entries I’ve actually never seen in full. The not very famous, but beloved, The Great Mouse Detective. I agree that this film is not known, but I don’t believe it’s THE most not known film in the Disney Canon. I give that title to “Saludos Amigos”. I think “The Black Cauldron” is less known than “The Great Mouse Detective”. The motivation for the characters is off. In Secret of Nimh she is trying to save her son. In LOTR they are trying to defeat evil. In Black Cauldron he is trying to get famous. But even all that could be ignored but the voice cast is just awful. I thought they were all bad.